Saga Studios, LLC has released the teaser for their first feature length film, a new documentary called Epic Home Haunts, which follows four groups of “home haunters” as they build some of the world’s most epic haunted attractions at their homes. 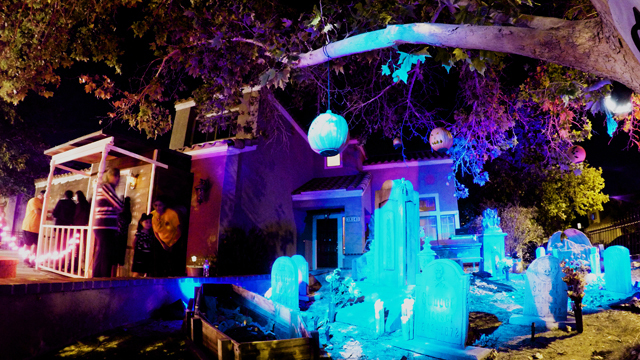 From creating a full haunted attraction complete with giant animatronic dragons, castles, and portals to other dimensions, to fully integrated interactive props the guests carry with them as they experience the haunt, these home haunters are rivaling what’s created at the professional theme parks on their driveways! “These haunters are literally shedding sweat, blood and tears to create some of the scariest most detailed hauntehouses in the world and they do it simply for the love of it”, says director Josh Quillin. “They don’t make any money either, what they collect is used for the haunt and donated to charity. The haunters want to bring their communities together giving their neighborhoods somewhere safe and thrilling to go to on Halloween”. Epic Home Haunts follows four home haunters throughout their 2016 and 2017 Halloween seasons, exploring the impact these haunted attractions have on their communities and the positive influence they have on their local neighborhoods. The home haunters begin planning the next year’s haunt one year in advance and construction begins in the summer before the Halloween season. The end result is an over 1500 sq ft. walk-through haunted attraction built on their driveways, lawns, back yards, and garages; the haunts never actually go inside of their homes. Thousands of people visit the haunted attractions each year allowing the home haunters to donate thousands of dollars and food to charity. You can check out the first official teaser trailer for the documentary, as well as some photos from the film, below. Epic Home Haunts will be released this October.